Spending time in nature is a great Spring Break activity that can also have a literacy component. Have your child write words describing what they see, and later compose a poem using those words. Springtime is fast approaching, and with that comes school spring break. Whether your family plans to spend the week at home or traveling, here is a list of 6 activities to keep children engaged in literacy throughout the break from school. Have your child help read board game instructions. Help him follow each of the instructions. Playing word/letter related games, such as hangman and crossword puzzles, can provide lots of fun ways to practice spelling and reading. Take the extra time with your children to become more familiar with the free resources your local library offers. Libraries offer children’s programs that support reading. In addition to books, you can also get access to technology and learning games. Take your child to a neighborhood playground to have fun and get some physical exercise. When you get home, ask him to write about his favorite part of your time outdoors. If he is just learning to write, ask him to dictate a few sentences to you. Provide assistance with forming the sentences when needed. Spend time observing nature. Sit outside and watch birds, or study clouds in the sky. Help your child write down some words that describe his observations such as sounds he hears or movements he might see. Using the descriptive words, help him write a short poem. Spring is near. Can you hear? Spring is near. Can you see? Spring is near. Can you feel? A Little Free Library is a small container of free books that can be exchanged within a community. These community sharing libraries help motivate readers, young and old. 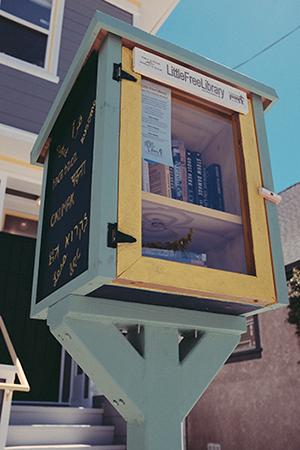 Click here to read a past blog about Little Free Libraries in Iowa. Use this map to see if there’s a little free library in your neighborhood. If so, talk to your child about a book she might like to donate to the library in exchange for getting a new book. Have your child choose one of her favorite authors. Help your child write a letter to the author. The letter can include your child’s questions for the author. It also should discuss reasons she liked the author’s book(s), and perhaps how she made a connection to the story. Look for the author’s email address. The author’s personal website might have the email address listed. You also might be able to connect with the author through social media. If you can’t find information on how to connect with the author online, you can send a physical letter in the mail. Look inside the book for the publisher’s address, and address the letter to the author. Have your child select a book he would like to record himself reading. Have him read the book to you a couple of times. Each time your child reads the book, have him try changing the voices for the characters or the way he uses expression when reading the sentences. Ask him if the different ways he read the book changed the meaning of the story. Record your child reading, using a tape recorder or a smart phone. Share his recording with a loved one.